Princess is a light bubblegum pink with golden flecks and holographic flakes. Shown is two and a half coats. Eternal is a tangerine orange with holographic flakes. Shown is three coats with top coat. Fresh is a bright lime green with holographic flakes. Shown is two coats. 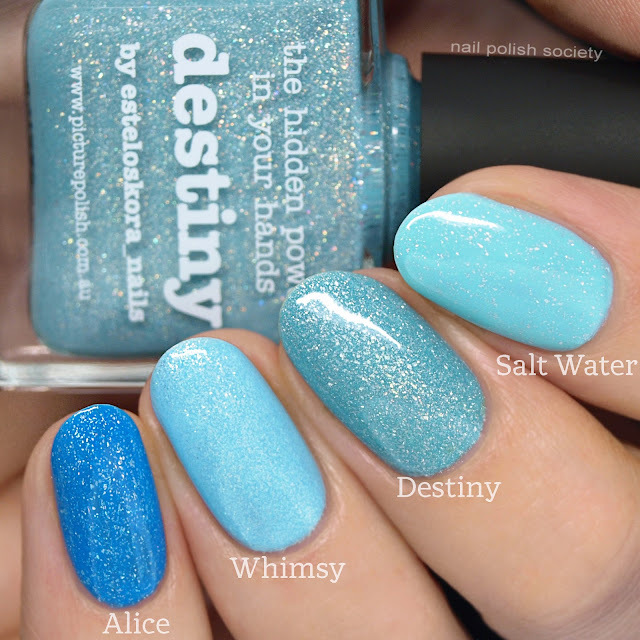 Destiny is a cool artic blue with holographic flakes. Shown is three coats with top coat. Royal is a rich, cool toned purple with holographic flakes. Shown is three coats with top coat. Fancy is a juicy peony pink with holographic flakes. Shown is two coats with top coat. Each shade retails for $14 AUD and can be purchased through the piCture pOlish website or one of their international stockists. What do you think of the new shades? Do you have a favorite? Fancy is my top pick because it looks so darn good on me. Destiny and Princess would be my next favorites. Let me know in the comments below if you have thoughts or questions!